The Place Hot on the heels of Aloha Poke is A Poke Theory, a healthy rice bowl concept along Boon Tat Street which plays on the same Hawaiian concept. As compared to Aloha Poke (read our full review of Aloha Poke) or Grain Traders (read our full review of Grain Traders) in the vicinity, the seating capacity at A Poke Theory is relatively huge (up to 60 seaters), which makes a huge difference if you are not planning to take away your rice bowl. The interior is as fuss-free as its concept – bare industrial vibe with maximum arrangement of tables and chairs for diners. We are not complaining. The Food The ordering system is fairly straightforward and self-service, choose between the Regular 100g (S$11.50 for Tuna, S$12.50 for Salmon) or Large 150g (S$15 for Tuna, S$16.50 for Salmon) bowls. There are four different flavours – Original Shoyu Tuna, Spicy Garlic Sesame Tuna, Spicy Mayo Salmon and Avocado Miso Salmon). You then get to round off your orders with complimentary toppings such as Edamame, Cherry Tomato and Pineapple. We had the Regular Spicy Mayo Salmon and Avocado Miso Salmon, and ended up fairly satisfied with the fresh chunks of sashimi. The portion was not huge, but sufficient if you looking for a light lunch. The overall flavour of our sushi rice coupled with the fresh toppings was refreshing, even though I seemed to derive greater satisfaction from Aloha Poke just round the corner at Amoy Street. Rants There are only tuna and salmon to pick from for now. Hopefully there are plans for other kinds of sashimi in time to come. And for crying out loud in this cashless age, payment is only by cash. Will I return again? 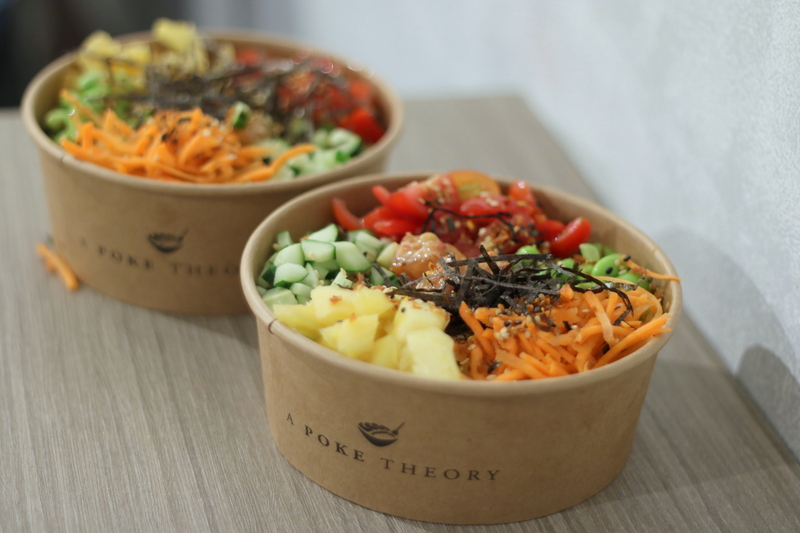 Choices are aplenty in CBD when it comes to healthy eats, with healthy poke meals trending for the past months, A Poke Theory adds to the variety on offer in town. However, for the price tag, we found the serving a tad too small and we didn’t find them exceptionally satisfying.